CoQ10 is a naturally occurring enzyme found in every living cell. It plays an important role in energy production and muscle activity. Your body`s cells are constantly producing energy to keep your heart pumping, muscles contracting and organs functioning properly. 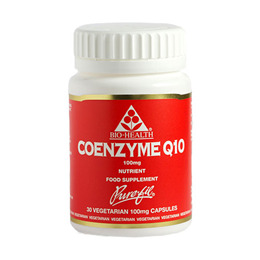 Co-enzyme Q10, or CoQ10, is a nutrient believed to play an important part in this energy production process. Co-enzyme Q10 is important for maintaining a healthy heart and energy release throughout the years. It is acknowledged that the amount of Co-enzyme Q10 present in the body declines with age, so supplementing the diet with Co-Enzyme Q10 may help in maintaining and supporting a healthy heart and cardiovascular system. Bio Health products are totally additive-free supplements of medicinal quality and are totally free from ingredients that have been genetically modified. Co Enzyme Q10 (Ubiquinone), Calcium Carbonate, Vegetable Hydroxypropyl Methelcellulose Capsule. Below are reviews of Co Enzyme Q10 – Heart Health – 30 Vegicaps by bodykind customers. If you have tried this product we'd love to hear what you think so please leave a review.